Today I followed my intuition to Eye of Horus where I took a workshop on Staving. You just might wonder what the heck staving is right now, and I’m getting to that. The teacher of this workshop is Kari Tauring, a musician, author, rune reader, and staff carrier. Through her studies of the Norse Myths and Sagas, her practice of working with the runes, and her inner journeys she has developed a wonderful tradition of working with the deep and ancient energies of the Nine Worlds. Völva is a reclaimed word from Old Norse which means literaly, staff carrier. 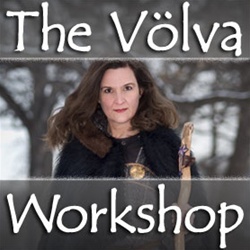 The women who were Völva carried their healing, far-seeing, ceremonial, and magical practice from farmstead to farmstead. We have learned about them from the medieval texts, sagas and eddas, the folk stories and songs. Today, many women in the United States and abroad are reclaiming the title and practices of the Völva. Here in Minnesota, Kari Tauring has developed Völva Stav. It’s a way to use the staff to create rythm for chant and song to journey and do energy work. In Ms. Tauring’s classes you will learn the history and vocabulary of the Northern pre-Christian mystical tradition. You will learn to use your body as the tool for your spiritual work — carrying your spine as the great stav and freeing your voice to call the ancestors. In group work, you will feel the fabric of the web of wyrd that holds all life together, you will hear it in the rhythm of other Völva as we shift and change and journey together.